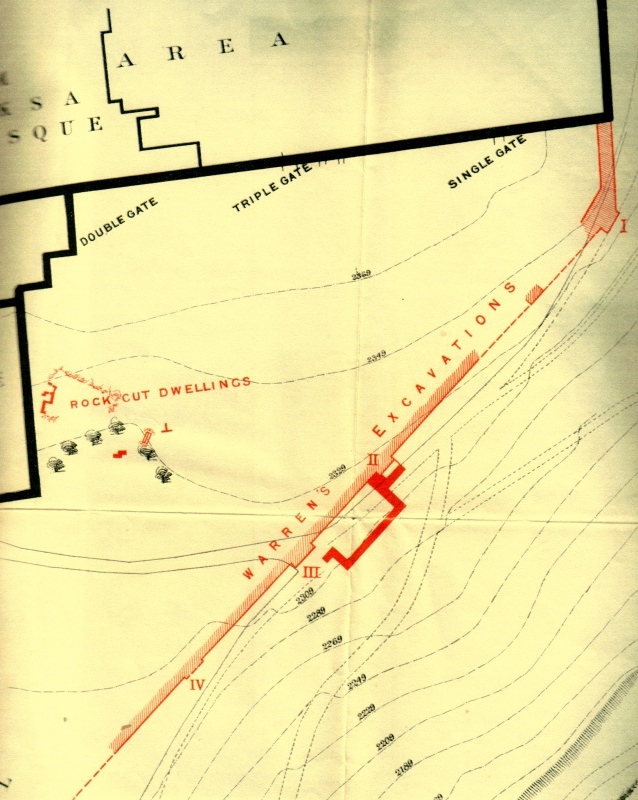 This chart shows the area that had been excavated earlier by Captain Charles Warren. It was Warren who uncovered the first clue to the existence of a gate at this point in the wall. While tunneling along the base of the wall that ran southward from the S.E. corner of the Temple Mount Warren encountered this magnificent tower and courtyard wall which protected a gate there, later found by Benjamin and Eilat Mazar. Unfortunatley, Eilat Mazar has incorrectly identified the gate as the Water Gate. This is actually the Horse Gate mentioned by Nehemiah and follows the Water Gate in his description of the rebuilding of the wall. The Water Gate lies to the south above the Gihon Spring. And David dwelt in the castle; therefore they called it the city of David. And he built the city round about, even from Millo round about: and Joab repaired the rest of the city (I Chronicles 11: 7, 8). So David dwelt in the fort, and called it the city of David. And David built round about from Millo and inward [house] (II Samuel 5: 9). King David built "round about" the city of David. II Samuel 24: 18 says - And Gad came that day to David, and said unto him, Go up, rear an altar unto the Lord in the threshingfloor of Araunah the Jebusite. II Samuel 24: 25 says - And David built there an altar unto the Lord... . It is from these verses that we learn that David was involved in building activity that was located northward from the city of David. Dr. Eilat Mazar has uncovered a four-chambered gate that is incorporated into the Ophel wall that runs between the city of David and the East gate of the Temple Mount. The four-chambered gate was constructed by Hiram's masons during David's reign and the attatched tower was constructed by Hiram's masons under Solomon's rule. Captain Charles Warren, discovered a wall along much of the Ophel ridge between the Palace area and the SE corner of the Temple Mount. In 1867 Warren discovered two towers (one large and one small) that guarded the gate that would later be found there. Dame Kenyon further examined the smaller tower (her Site S II) in the 1960s. The large, beautiful stones found there reminded her of the Phoenician stones at Samaria and caused her to a “reasonable inference” that they were Solomonic. The tower has been shown to be later than the wall that it is attached to and, if the tower is Solomonic, then the wall and gate would belong to David's time. It should be mentioned here that two beautiful four-chambered gates from David's time have been found at nearby Khirbet Qeiyafa. 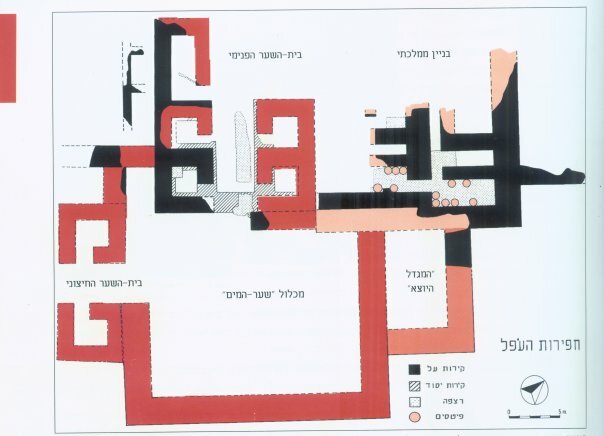 Dr. Eilat Mazar in her book, The Complete Guide to the Temple Mount Excavations, on pages 7-9 concluded that the gatehouse was built in the 10th century as part of a wall constructed by King Solomon. She mistakenly identifies the Horse Gate gate as the "Water Gate". 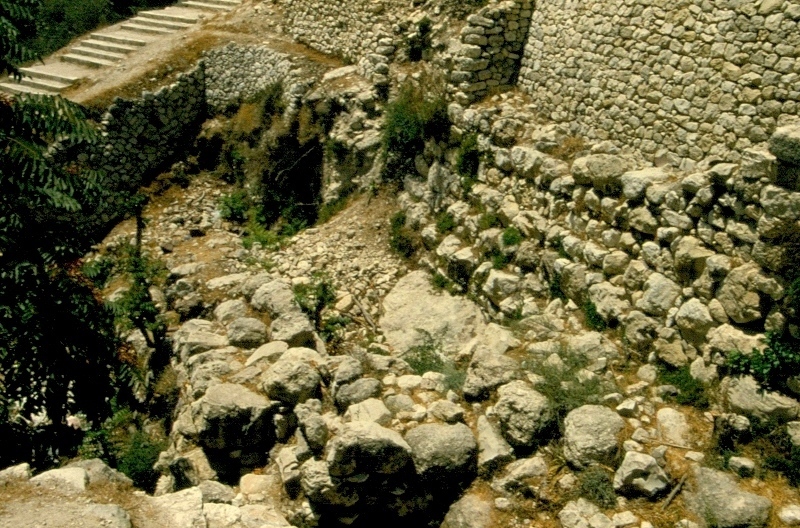 The Water Gate will be found to the south, along the mid-slope wall above the Gihon Spring, and is associated with a passageway recently discovered by Ronny Reich and Eli Shukron. Eilat Mazar has excavated a four-chambered gate in Ophel that she dates to the time of David and Solomon. Large boulders revealed by Kathleen Kenyon in the 1960's were associated with the Jebusite Water Gate (left) and are partially covered by Hezekiah's mid-slope wall (right) . 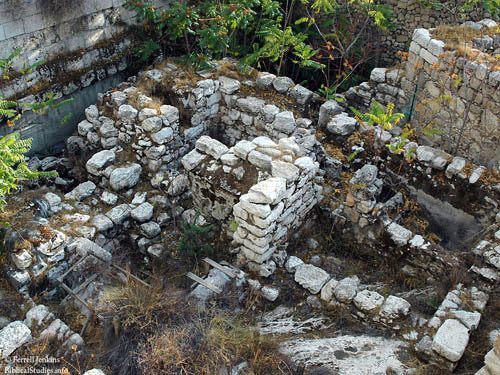 The Gihon Spring, with its channel, pool, passageway, and tower, lies at the bottom of the stairway (upper left).